The octogenarian Ahmed is lone survivor of gifted Indian team that missed playing the World Cup back in 1950. Ahmed Khan will follow the FIFA World Cup, which kicks off later this week, with special interest and considerable regret. The last time the world’s biggest single sporting event took place in Brazil, India had qualified for it. They were placed in Group C alongside Paraguay, Italy and Sweden. And Khan was the pivot of a fledgling team that was making rapid strides in international football. However, owing to logistical reasons and the All India Football Federation’s (AIFF) shortsightedness, India let the opportunity slip by. In the ensuing 64 years, not a day has passed when Khan hasn’t felt remorse. 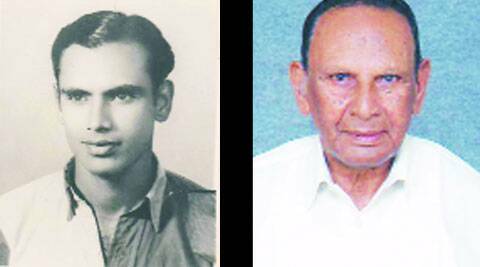 The 88-year-old, a Bangalore resident, is the only surviving member of the squad that would have made the long journey to Brazil by ship. “Representing India at the World Cup would have been an icing on the cake for that gifted generation,” Khan says. Gifted indeed. The Indian team back then comprised some rare talents. P Venkatesh and P B Saleh played on right and left wings respectively, Appa Rao played in the inside right position of a classical 2-3-5 formation while Dhanraj was center-forward. These were four highly talented individuals but what made them unstoppable was the dexterity of left inside forward Khan. Together, the ‘Panch Pandavas’ of Indian football created havoc in the opposition defence and took the team to great heights. “India was invited to participate in the 1950 World Cup in Brazil considering the high standard of football those years and also keeping in view the appreciable performance of the Indian team at the 1948 Olympics. We lost to France 2-1. Had we not missed two penalty kicks against France, the result would have been in India’s favour,” Khan recalls. “In appreciation of my close ball control, the press and the public in London nicknamed me the snake charmer.” The East Bengal club named him forward of the millennium. India were to open their campaign against Paraguay on June 25, 1950, at the World Cup. But, as legend goes, FIFA did not allow India to take part as boots were mandatory and most Indian players were used to playing barefoot. Khan says they were made to believe by the AIFF that that was the reason the team was withdrawn from the World Cup. The players, he insists, weren’t too aware of the magnitude of the World Cup back then as the Olympics was their main focus along with the inaugural Asian Games, which were to be held in Delhi the following year. Khan represented India in two Olympics and two Asian Games. Instead, following that decade of excellence, Indian football went downhill. The country hasn’t come close to making the cut for the World Cup since. Khan’s brother Amjad says the former has not been to a domestic game in decades. Khan, however, is a keen follower of European football and has his money on Germany lifting the World Cup next month in Rio. “They have a pretty strong squad with a blend of experience and youth. They have the best players in almost all positions. They have a mature, skillful and mentally strong team,” says Khan.